"The Star-Spangled Banner" is the national anthem of the United States of America. During the 19th century, “The Star-Spangled Banner” became one of the nation’s best-loved patriotic songs. Despite its widespread popularity, it did not become the National Anthem until 1931. The lyrics come from a text written by the gifted amateur poet Francis Scott Key in 1814, when he was inspired by the American victory at the Battle of Baltimore in the War of 1812. When he saw that the American flag was still waving above the fort and had not been removed in defeat the morning after the bombings of Fort McHenry by the British Royal Navy ships, this sight inspired him to write an initial verse on the back of a letter he had kept in his pocket. He completed the four stanzas later on and entitled them "Defence of Fort McHenry”. In the fourth stanza, Key urged the adoption of "In God is our Trust" as the national motto ("And this be our motto: In God is our Trust"). The US adopted the motto "In God We Trust" by law in 1956. In 1861, a fifth stanza was added to the song by Oliver Wendell Holmes, who wanted to share his indignation over the start of the Civil War. It appeared in songbooks of the era. Today only the first stanza is commonly sung, with the fourth added on more formal occasions. The poem soon attained wide popularity when it was set to the music previously composed by an English composer John Stafford Smith, “To Anacreon in Heaven” (1775). This tune was the official song of the 18th-century Anacreontic Society, a men's social club in London and it quickly became popular. 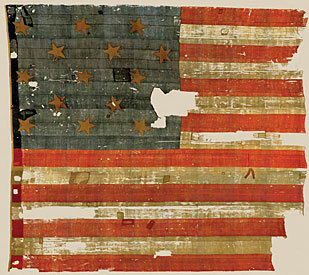 Soon after, the words and music were published together under the title "The Star-Spangled Banner”. It gained popularity throughout the nineteenth century and bands used to play it during public events and celebrations. 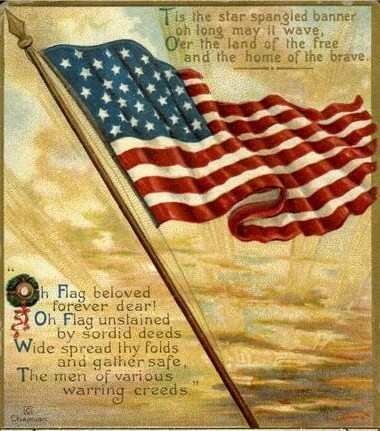 "The Star-Spangled Banner" was recognized for official use by the Navy in 1889 (ceremonial purpose). In 1916, President Woodrow Wilson ordered that "The Star-Spangled Banner" be played at military and other appropriate occasions. In March 1931, 116 years after it was first written, President Herbert Hoover signed the law proclaiming it as the national anthem. Due to its wide range of one and a half octaves, the song is known for being difficult to sing for non-professionals. The song is often pre-recorded because even professional singers have been known to forget the lyrics. Another way to avoid this problem is for the performers to play the anthem instrumentally instead of singing it. "The Star-Spangled Banner" is traditionally played at the beginning of public sports events and orchestral concerts in the United States, as well as other public gatherings. In the United States Code, it is stipulated that, during a rendition of the Star Spangled Banner, everybody should face the flag with the right hand over the heart; men not in uniform should remove their headdress with their right hand and hold the headdress at the left shoulder, their hand being over the heart. Individuals wearing the uniform should give the military salute as soon as the anthem begins and maintain that position until the last note. Ce que nous acclamions si fièrement au crépuscule ? Au sommet de nos remparts nous regardions flotter si fièrement ? Nous prouvaient à chaque instant de la nuit que notre drapeau était toujours là. Sur la terre de la Liberté et la patrie des braves ? - The 1991 version by the St. Louis Symphony under Leonard Slatkin. - At Buckingham Palace (London), the day after the terrorist attacks of 9/11 in NYC, at the Changing of the Guard, the Band of the Grenadier Guards played the American National Anthem instead of the British one as a show of support for her ally.